Regulated to obtain a DC power to charge a battery, studying parameters such as solar module´s current output charge level, battery voltage, etc. Delivered to DC loads, studying parameters such as solar module´s current output and current consumption by the loads. Converted to AC power to be delivered to AC loads, studying parameters such as current consumption by the loads. Injected to the grid, studying parameters such simulated solar module´s current and voltage outputs, power injected to the grid, mains voltage and frequency, etc. Three different versions are available with different practical possibilities and levels of difficulty: MINI-EESF, MINI-EESF/M and MINI-EESF/B. Both the protections and the used materials give it water proof properties, abrasion protection, hail impact protection and several other adverse environmental factors protection. functions that can be activated such as the settings, night light function and auto-test. The regulator is equipped with various devices to protect its electronics, battery and load. ES20. Loads module that incorporates two 12 V, 50W lamps, with independent switches. ES30. DC/AC inverter that outputs a sinewave shaped output of 230V/50Hz ± 2% (or 115V/60Hz ± 3%) and the nominal input voltage is 12Vdc. Two different operating modes: continuos mode and ASB mode (Auto Standby) to reduce the power consumption. It is provided with a diagnosis system to indicate the user the status by different flash sequences. 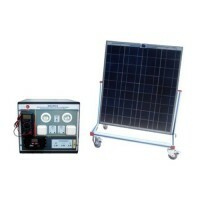 Inverter used for the conversion and injection to the grid of the power generated by a simulated source of renewable energy. The simulated source is a simulator used to obtain a variable power to be injected to the grid. The operation mode is displayed by means of a LED indicator at the front side of the housing. It is equipped with extensive safety measures to ensure that it switches off immediately as soon as the AC plug is removed from the wall socket or the public grid fails in operation. The inverter can be connected to a PC through RS232 communication to display some parameters such as voltage and current inputs, mains voltage and frequency, maximum AC power, KWh, etc.